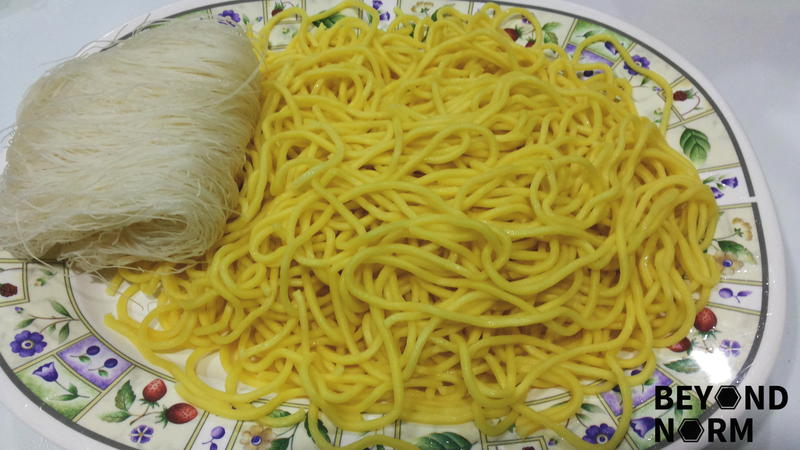 I was drooling while writing out the recipe for this Har Meen. Mmmm…. 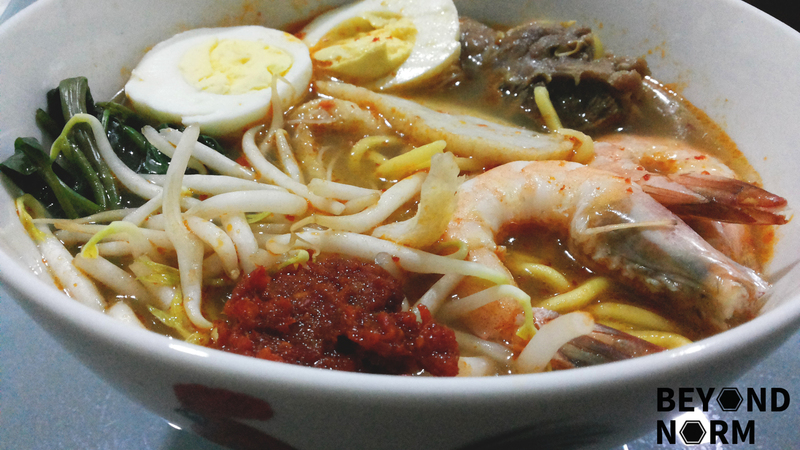 I could smell the yummy prawn aroma from the broth. The flavour of this noodle is just unspeakable not to mention the tremendous amount of time and effort to put this recipe together. So I hope that after reading this recipe you will put in some nice comments in our blog for all these efforts to encourage me. (Hahaha). It will be a great motivation for me if you could provide us with some feedback/comments either via our blog or by joining our Mummy’s Kitchen Facebook Group after you have tried this recipe. You can like us on Beyond Norm’s Facebook Page or subscribe to our blog via the right side bar to get the latest updates. Blend the chili paste ingredients (except the oil) until finely ground and well blended. Heat up the wok and add cooking oil. Add in the blended ingredients and stir fry for 5 minutes. Mix in pinches of sugar and salt to taste. Set aside. Heat up the same wok (unwashed), add in a little oil. Add in the shallots, garlic and ginger and fry till fragrant. 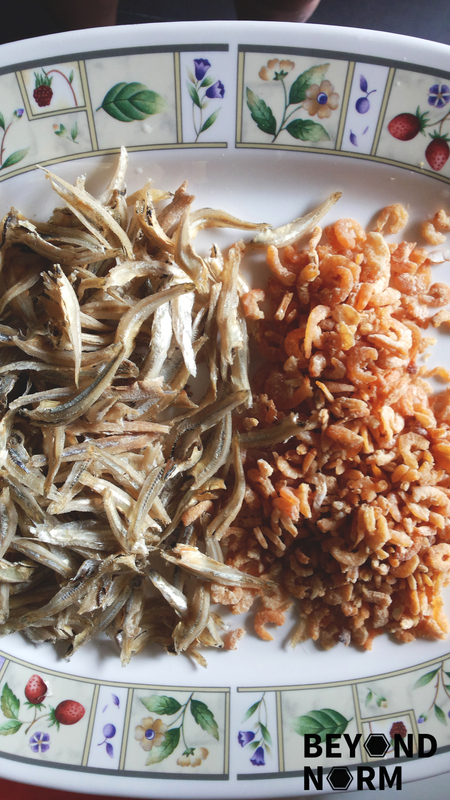 Add in the dried shrimps and ikan billis and fry for 2 minutes. 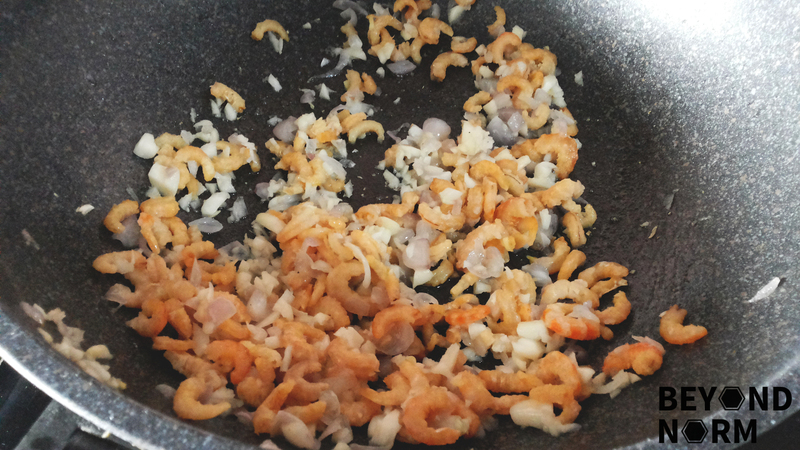 Add in the prawn heads and shell and fry till aromatic. At the bottom of the wok you will see some good prawn stock. Fill a stock pot with 15 cups of water and bring it to boil. 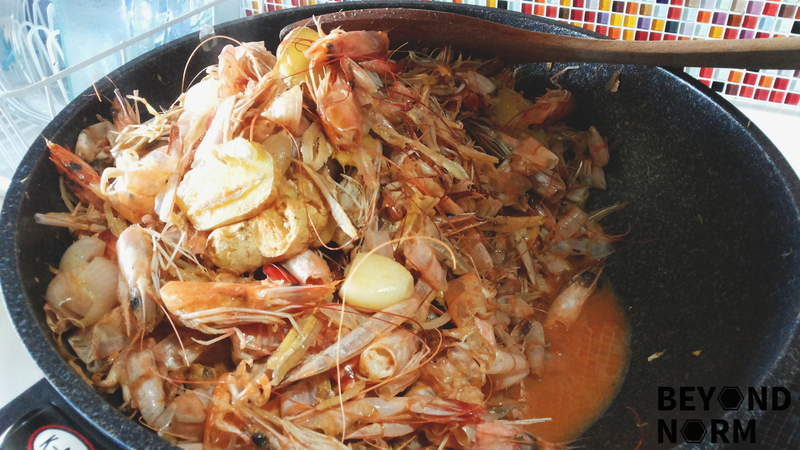 Transfer the fried shrimp heads and shell and simmer on low heat for about 2 hours or longer; until the stock has developed its flavour. Then strain the stock through a sieve and transfer the stock into another pot. Discard all the ingredients in the sieve. Bring the stock to boil again, add 2 cubes of rock sugar and the chili paste. The amount you add will depend on how spicy you want it to be. Add in the pork ribs and continue to boil in low heat for another 1 hour or longer; till the pork ribs are thoroughly cooked. Adjust the taste by adding salt or rock sugar, if required. 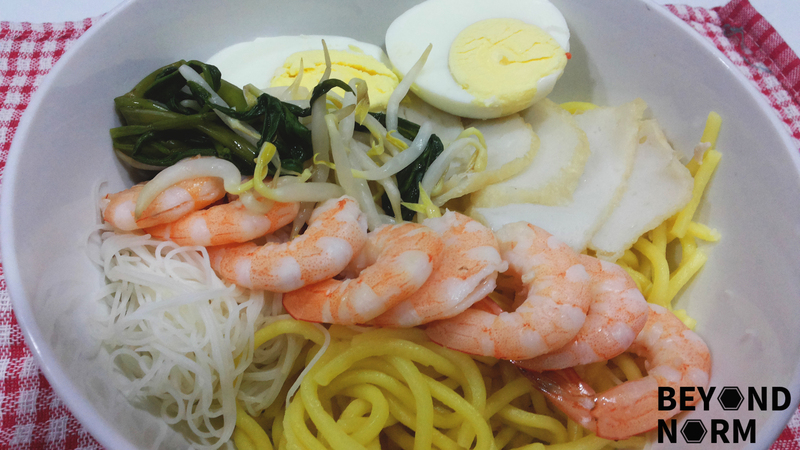 Place a portion of yellow noodles, rice vermicelli, kangkong and bean sprouts in a bowl. Ladle hot stock over it. Top with pork ribs (or meat slices), sliced shrimp, and egg. Sprinkle with fried crispy shallots. Serve immediately with some extra chili paste to taste. The above measurements are just a guide. Feel free to add or reduce the amount of noodles and seasoning. Hi Josephine, ..stumbled across your website a few days ago and I love all your food recipes. Please keep them coming.